The blog summarizes how to locate ScanPST.exe aka Inbox Repair Tool in Outlook 2016/2013/2010/2007 versions. In addition, we are also going to discuss how you can run ScanPST.exe to repair Outlook PST files. MS Outlook is one of the most known email clients used by several organizations to communicate internally and externally. It consists of two data file i.e. OST and PST. Offline OST files are the replica of Exchange data which is stored on Exchange Server. It permits users to work offline even in the absence of Internet. And it gets synchronized with the Exchange Server when the Internet connectivity is re-established. Whereas, PST (Personal Storage Table) files keeps all the essential user data which include emails, attachments, drafts, notes, lists, tasks, appointments, journals, contacts, calendars, etc. locally on the user machine. Microsoft provides its users with an inbuilt utility called ScanPST.exe. It is automatically installed along with MS Outlook application. 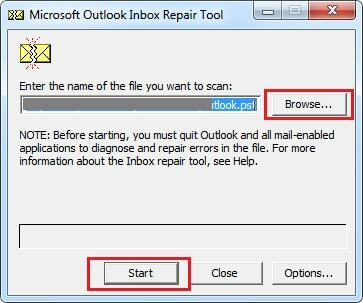 Whenever Outlook users come across Outlook errors, it becomes necessary to take help from Microsoft’s inbuilt utility called ScanPST.exe which is also known as Inbox Repair Tool. There are chances, when Outlook PST file gets corrupted due to virus attack, abrupt system shutdown, user profile deletion, malware attack, sudden termination of Outlook program, etc. Therefore, to cater such issues, you can choose ScanPST.exe to scan and repair your Outlook PST files. Now, you need to browse the location of PST file that you want to repair. Once selected, click on the Start button to initiate the scanning process. Despite having many advantages, ScanPST.exe has some disadvantages too. Unable to repair severely corrupted Outlook PST file. The complex and tedious task to perform. Must have the technical knowledge to operate the tool. You can run ScanPST.exe to repair Outlook PST file only when the corruption level is minor. If the corruption is severe, I would suggest you opt for a reliable and affordable Shoviv Outlook PST Recovery tool to repair and recover PST file thoroughly. It is integrated with the highly advanced algorithm and easy-to-use interface. Non-technical users can operate the tool easily without taking any technical assistance. Above in the blog, we have described both manual and automatic way to repair Outlook PST file. However, choosing professional Outlook PST Recovery tool over ScanPST.exe would be a wise choice.